I absolutely love your designs! They are really beautiful. Did you use stock Sugar & Cream cotton, or did you dye them yourself? I didn’t see any reference to to you being on Ravelry. If you aren’t, you should sign up & sell your patterns there-you’ll have a tremendous pool of potential buyers. I will definitely be buying some of your patterns when I finish my 2 test knits! Keep up the great work! Thank you. It’s very sweet of you to drop a note. Yes, I do use Lily Sugar’n Cream cotton yarn primarily. I also do use other Spinrite cotton yarns (Peaches & Cream, Bernat’s Handicrafter Cotton). I’ve also tried Martha Steward’s Cotton Hemp and Red Heart Creme de la Cream. The last 2 do knit up differently than the Spinrite yarns. I hope to be able to buy some Knit Pick’s Dishie yarn soon and then yarn comparison on my blog. I have bought two of your patterns and just love them. I really would like to purchase the dahlia pattern. Please let me know how to do this! Your double knitting is just beautiful! Ok, I’ll put that on one the list to make as a pattern. Over the months, I’ve made several attempts to tweak the pattern (less details, more graphic), but after about 15 tries, I think this is the best I can make without making the pot holder huge. Done. I’m glad you said something. I just assumed it was too obscure of a hobby for me and that I should try and make other more common types of flowers. I purchased 2 patterns from you on February 25, 2015. Unfortunately, I didn’t download the Tree of Life pot holder and now I can’t find the link! Could you forward me another link for this pattern. I’m all set with the other pattern, the Dragonfly pot holder – more than halfway done and loving it! Great instructions! Thanks for the order. I sent the instructions on how to download the patterns from the site and also e-mailed the patterns to you directly. Please let me know if that didn’t work. 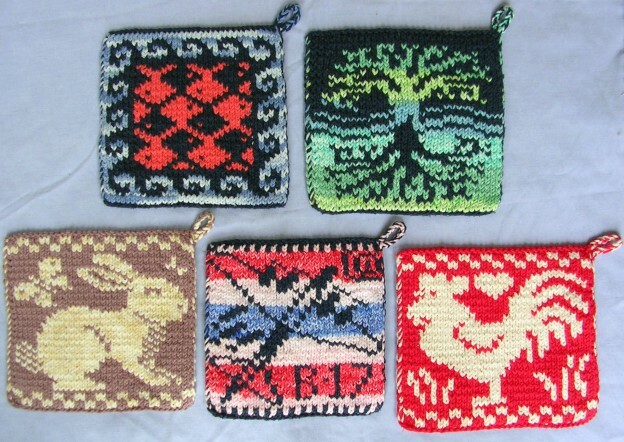 I really love the Dahlia and Mermaid Potholder patterns and would love to know how I can get them. I just love the Dahlia and Mermaid Potholder patterns and would love to know how I can get them.